For its blue pot PÖPPELMANN blue® from the pro-K Industrieverband Halbzeuge und Konsumprodukte Kunststoff e. V. has been awarded. 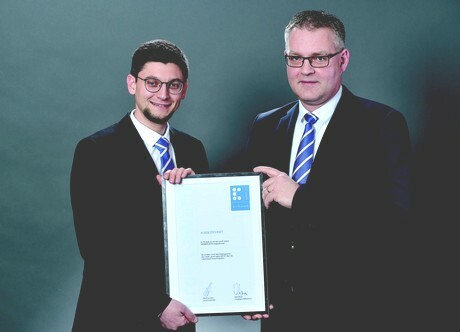 At the award ceremony in Frankfurt am Main, the TEKU® sales manager for the German-speaking region and the Benelux countries, Arno Zerhusen, and technology scout Benjamin Kampmann from Pöppelmann innovation management received the pro-K Award 2019. With the plant pot of the Recycling Blue series, Pöppelmann TEKU® first developed the raw material cycle for the production of a series product from postal Consumer Recyclate (PCR) completely closed, the jury justified their decision. The members were enthusiastic about the product idea: "Ingenious solution! Minimal use of materials, super light made of 100 percent recycled material. With this concept, Pöppelmann was able to set standards as a pioneer in the industry," the association stated.